Wow what a week this has been! 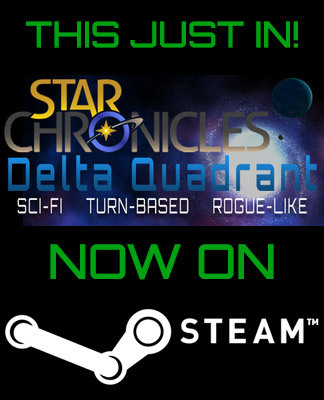 We finally got Steam integrated into Delta Quadrant, and we launched the game officially on 7 July 2015. Our very first title, and hopefully the first of many, on Steam. We took the plunge and paid the $100 to get into the Greenlight process. Now, $100 doesn't sound like a lot, but here in South Africa it's quite plenty in fact, especially if it's money you don't really have. Anyway, we scraped and paid the money and put Delta Quadrant onto Greenlight. At first it went really well - we got 50 yes votes on our first day, but it slowed down drastically after that, in the end only averaging about 1 or 2 yes votes per day. At that rate it would take years to get our game Greenlit. Luckily, the awesome guys from Groupees contacted us and offered to put our game on their Build a Greenlight bundle. Not only should it help with some much needed votes, but we'd also make some money back - we have, after all, just put money into the game for over 2 years already, so making something back, even if just a few hundred dollars would be great! It was a massive success, and shortly after the bundle finished we got this magical email from Steam, congratulating us on getting Star Chronicles: Delta Quadrant greenlit. It took 46 days. Launch day came, and within minutes we got our first mention on the discussion thread on our Steam Store Page. It was not good! A game breaking bug prevented people from even playing it! Luckily we did some very quick damage control and launched our first patch. We also apologised profusely for our mistake - luckily, it seems, the people we crossed forgave us, because we got our first YES and excellent review from a player in the UK! Reading nice things like that about your game really is an excellent feeling, and makes it all worth it! We've fixed a few more bugs and the game is nice and stable now, and, together with the Groupees group, over a thousand people have activated the game. And they're playing it! I want to conclude this update with a massive thank you to each and every single person who has purchased our game so far. And an even bigger thanks to people providing us with feedback - we really take everything you guys say to heart. Yes, we've made a few mistakes, but this is we learn! So please, keep the great feedback coming, and once again, thank you thank you thank you! Newest blog update about marketing DQ, update on my greenlight stats and some good news on the horizon. New updated Demo version 1.10 Fixed reported bug, where the screen or map would drag/scroll too fast or even snap from bottom to top. looking really nice! I'm tracking it!